* Beautiful custom 3 bedroom home that sleeps 6! Enjoy this quiet,tranquil private seaside community with all the amenities of abeautiful resort! * Playa del Oro is voted the #1 Development in San Felipe! We're on the sea side of San Felipe! * Everything you need to enjoy an active or peaceful vacation is right within the Playa del Oro development. * Have your morning coffee or afternoon margarita on the patio or the rooftop while you enjoy the beautiful ocean and mountain views from our home! We have an unobstructed view of the mountains and the ocean from our patio! * Take a walk on the private beach, a short walk from our house, and generally you have the whole beach to yourself! Or drive your favorite off road vehicle (ATV) on the beach! * Three bedroom (queen beds in all rooms) home that includes everything you'll need to enjoy your stay! Fully equipped kitchen, all new appliances, towels,linens, CD/DVD player, (with a large collection of DVDs to watch), SATELLITE TV water filtration system, individually controlled air conditioning/heating in each room, ceiling fans in each room. * BBQ, large brick patio and covered patio, outdoor shower and rooftop access with a 360 degree view of the mountains and ocean, beautiful to watch the sunrise/set. * Jacuzzi, lap pool and family pool! Private beach with private access, grocery store with deli and fresh bakery, pizza parlor, gym, laundromat/laundry service, restaurant/bar/live entertainment - all within the property! * San Felipe is safe to come to, we have never had any problems or felt unsafe in San Felipe. For your added protection we have 24/7 security at Playa del Oro. prices listed are for low season and increase for high season and special events such as easter; spring break , semana santa and the baja 250 race; also increase for american and mexican holidays such as memorial day, 4th of july and labor day as well as other holidays; all properties are subject to the 16% federal tax. to reserve the property you will need to pay vacation rental or homeway or VRBO 8% of the posted rental rate x the number of nights you will be staying. at that time you will have the ability to get our phone number and we will be able to see you phone number; PLEASE MAKE SURE YOU LIST YOUR PHONE NUMBER IN YOUR REQUEST; ALL OUR PROPERTY OWNERS REQUIRE WE SPEAK TO POTENTIAL RENTERS TO REVIEW THE BALANCE OF THE DEPOSIT NECESSARY, WHAT THE TOTAL EXPENSE WILL BE PLUS THE FULLY REFUNDABLE DAMAGE/MISSING ITEM DEPOSIT. AND THE RULES OF THE PROPERTY. EACH HOME HASE ITS SPECIFIC RULES DEPENDING ON ITS LOCATION AND OWNERS REQUIREMENTS. 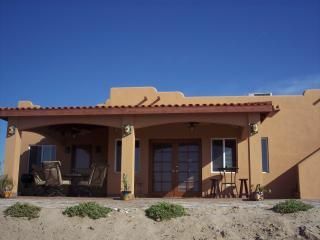 I would highly recommend for anyone who is interested in visiting San felipe,to saty in Playa del Oro, not only was it safe, but the house we stayed in was better that some of the beach houses I've rented in Ventura. We never encounter any problems with authority or the people that live in the town. We found many Candians that live in Sanfelipe. They told us they were very happy, and they have bought property there. The house we rented was very clean and very up todate. We were afraid because of all the bad media that mexico has been getting,due to the drug cartel, but we found it to be safe and we will difffentaly be returning and staying at Playa del Oro, SanFelipe. Thanks Sandy! We're so happy you enjoyed your stay and look forward to renting to you again! We enjoyed our stay at Casa de Irvine, the home had everything you could ever need. Great view from deck and roof top patio(amazing sunrises and sunsets). Home was very clean and the Irvines were very helpful. Thanks for recommending Pablo our fishing trip was great. Hope to meet you sometime when we are down again. Kelly & Bernadette, Thank you, I'm so happy to hear you had a wonderful time! We love spending time at our home and enjoying the views and it's always nice to hear others do too! Glad to hear the fishing was a success too - we always catch more than enough! Hope to meet you when you're down sometime! * The town of San Felipe is about 10 min away and there you can enjoy beach activities and beach rentals (banana boat rides! ), kayaking, fishing (or as we say 'catching' - we can recommend Pablo to take youfishing!) great restaurants, ATV rentals - many sand/dirt trails to ride, nightlife/night clubs,shopping, great restaurants and much more. * Rent or bring your own ATV or dune buggy, you'll have miles of beaches and trails right from our private beach in the development! * Many great local restaurants (I'll be happy to give recommendations! )with activities such as Karaoke, Name that Tune, etc. * I have many more photos, just ask if you'd like to see more!